I do not hate anyone. I do not hate any of the Popes. I do not hate any Catholics. They are sinners for whom Jesus Christ died, just as I am. I love Catholics, just as I love everyone with God's unconditional love. The love of God is unconditional. Christians who walk with God have God's love shed abroad in their heart, unconditionally loving others. I don't mean to be unkind by saying that Catholics are going to Hell; but rather, to speak the truth and warn you of the judgment to come (2nd Thessalonians 1:8-9; Revelation 20:15). The modernistic idea that we should all refrain from criticizing anyone else's religion is a completely evil New World Order philosophy. I'm going to speak the truth of God's Word, even if it offends you. I am going to warn you that you are on a wrong road, headed for the bottomless pit, even if you hate me for it. I am telling you the truth. Catholicism is a manmade religion that cannot save you. There is NO salvation in the Catholic Church; only idolatry, worshipping of the dead, heathendom, rituals, vain repetitions and doctrines of devils (1st Timothy 4:1). Salvation is NOT found in any religion; but rather, in a Person, the precious Lord Jesus Christ! Billions of lost sinners are dying in their sins and plunging into Hell because of the lying Popes and priests who deceive them. Romans 10:3, “For they being ignorant of God's righteousness, and going about to establish their own righteousness, have not submitted themselves unto the righteousness of God.” Jesus warned about following the commandments of men (Mark 7:6-13). Here's a list of Catholicism's manmade traditions fabricated over the centuries. Matthew 23:13, “But woe unto you, scribes and Pharisees, hypocrites! 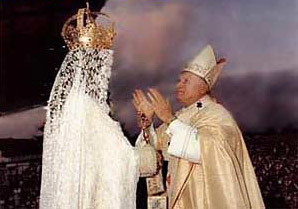 for ye shut up the kingdom of heaven against men: for ye neither go in yourselves, neither suffer ye them that are entering to go in.” Woe until the Catholic Church and their idolatrous worship of idols and images! Exodus 20:4-5 (the second of the Ten Commandment) strictly forbids even BOWING to images. The Vatican has deceitfully removed the 2nd Commandment in their Hellish Catechism! Satan is a master of deception!!! The Word of God states in 2nd Corinthians 11:3-4, "But I fear, lest by any means, as the serpent beguiled Eve through his subtilty, so your minds should be corrupted from the simplicity that is in Christ. For if he that cometh preacheth another Jesus, whom we have not preached, or if ye receive another spirit, which ye have not received, or another gospel, which ye have not accepted, ye might well bear with him." Catholicism preaches ANOTHER GOSPEL and has ANOTHER SPIRIT. The Gospel (Catechism) of Catholicism REQUIRES a person to be water baptized into the Catholic Church to go to Heaven. Catholics are also REQUIRED to keep the Seven Sacraments to go to Heaven. These Sacraments include being confirmed by the priest, regular confession to the priest, regular observance of the Holy Eucharist with the priest, last rites by the priest, et cetera. The Catholic means of salvation; therefore, weighs heavily upon the Catholic priest. When James spoke of being justified by “works,” he was clearly speaking about being justified in the eyes of MEN ... “I will shew thee my faith by my works” (James 2:18). Also, James was writing to believers; not the unsaved (James 2:1, “My Brethren...”). With God we are justified by faith; but with men by works, because men cannot see our heart as God can (1st Samuel 16:7). Here is PROOF that James wasn't teaching works salvation ... “Was not Abraham our father justified by works, when he had offered Isaac his son upon the altar?” (James 2:21). Isaac? We read in Genesis 15:6 concerning Abraham, “And he believed in the LORD; and he counted it to him for righteousness.” Abraham was saved by faith alone in the Lord. Isaac wasn't even born until Genesis 21:3. Clearly, James is referring to two different types of justification here. In Genesis 15, Abraham is justified with God by faith ALONE; BUT in Genesis 22, Abraham's faith is justified by works in the eyes of men. 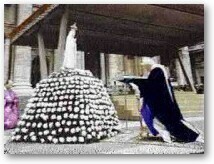 Catholicism's spirit is one of idolatrous adoration of the Blessed Virgin Mary. In fact, it is a spirit of demonism (1st Timothy 4:1), as is evident by the vain repetition of 53 "Hail Marys" in a standard Rosary prayer. Jesus condemned vain repetitious prayers (Matthew 6:7). Yet, they moan like a cult of Satan worshippers. 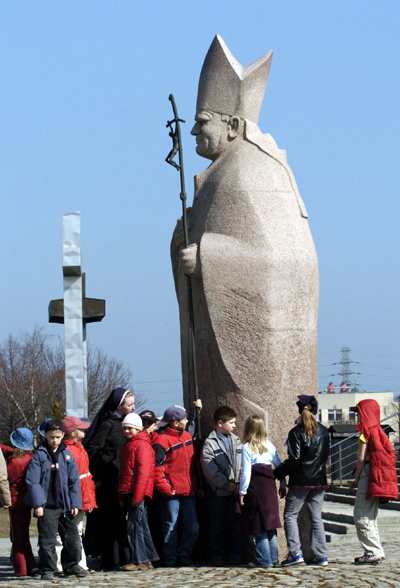 Catholics have statues galore. Oh, how rebellious and sinful are the hearts of Catholics! They have religion without truth, churchianity without Christianity, and crucifixes without Christ. The average Catholic is brainwashed with Catechism training and knows little about the Bible. The Word of God is clear that we are to bow at the name of Jesus (and NO other). Let me ask you a question friend. What religion, or group of ministers, are the above Scriptures warning us about? Most people would agree that Mormons and Jehovah's Witnesses are false prophets. BUT, what about Catholicism? How does Catholicism compare to God's Word? Not very well. The Catholic Churches' practice of celibacy is DEMONIC! Catholics are not allowed to eat certain meats on Fridays. This teaching is DEMONIC! 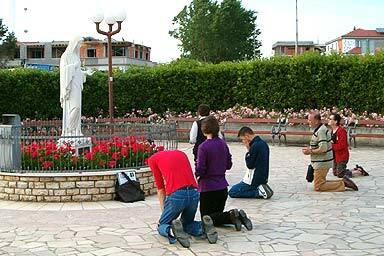 Matthew 6:7 forbids praying in vain repetitions; but that is exactly what Catholics do. Exodus 20:4-5 prohibits bowing to graven images; yet, Catholics defiantly bow anyway, and then have the audacity to blaspheme God by saying it's not idolatry. There are 1,000 things wrong with the Catholic religion! If you'd like to learn much more about the evils of Catholicism, then I plead with you to search the links at the bottom of my Hail Mary! Hail Satan! page. I am being your friend by telling you the truth. Catholicism is religion, no more. Religion won't forgive your sins or take you to Heaven. You need to be born-again by the Spirit of God. Jesus plainly stated in John 4:24 that you cannot worship God in heresy. You MUST worship God in Truth! Jesus is the Truth (John 14:6). God's Word is Truth (John 17:17). If you've never received Jesus Christ as your personal Savior, then I plead with you now to trust upon the Lord to forgive your sins. Catholics are going to Hell because they have chosen to follow the traditions of men, instead of obeying the gospel of Jesus Christ. Salvation is without works of self-righteousness (Romans 10:3-4; Ephesians 2:8-9; Titus 3:5). Eternal life is a free gift (Romans 5:15; 6:23), freely offered (Romans 10:13), and freely received (Revelation 22:17). We are saved by HIS RIGHTEOUSNESS, i.e., the imputed righteousness of Jesus Christ (2nd Corinthians 5:21; Matthew 6:33). Our part is simply to believe on Jesus as the Christ, the Son of God, to forgive our sins (Acts 10:43; John 20:31; John 1:12). If you BELIEVE (rely) upon Jesus' dying on the cross for your sins, and that He was buried, and bodily resurrected three days later, you are saved!!! Salvation is a new birth. You cannot ever lose eternal life. Once you are born-again, it is irreversible and permanent. Many people view religion as a good therapy, a necessary part of life; but they deny the saving power of the Gospel of Jesus Christ, just as 2nd Timothy 3:5 says, “Having a form of godliness, but denying the power thereof: from such turn away.” Religion cannot take you to Heaven. You need to be born-again by the Spirit of God, by the Seed of God's Word (1st Peter 1:23), by faith in Jesus Christ. Galatians 3:26, “For ye are all the children of God by faith in Christ Jesus.” Eternal life is a free gift!